Vehicles newer than 1980, and in some cases, newer than 1990, use various methods of fuel injection to get fuel into the engine. Some vehicles even used fuel injection as early as 1974. Automakers using Bosch’s K-Jetronic fuel injection included the Lamborghini, BMW, Mercedes-Benz, Audi and Volvo. The fuel injection system in comprised of many different parts, from the sensors and OEM fuel injectors to the electronic control unit. Fuel injected cars have better fuel mileage and start easier than carbureted vehicles. Single Point Injection: Single point injection uses one OEM fuel injector to atomize the fuel as it enters the engine. The fuel injector is housed in a throttle body. Single point fuel injection has been around since the 1940s when it was used in aircraft engines. It was introduced to vehicles in the 1980s. GM called it throttle-body injection and Ford and Mazda called it central fuel injection. Continuous Injection: Bosch’s K-Jetronic fuel injection was continuous fuel injection. Newer methods of fuel injection shoot fuel into the engine via short pulses, but continuous injection, which could be single point or multi-point, shot a continuous stream of fuel into the intake manifold. Multi-point Fuel Injection: Multi-point fuel injection uses more than one OEM fuel injector. If the engine is a four-cylinder, it uses four, a six cylinder engine uses six and a V8 uses eight fuel injectors. The injectors are tied together via a fuel rail and wiring harness. These systems may be sequential or direct. Sequential fuel injection has OEM fuel injectors that shoot fuel into air before it hits the intake valve. Direct fuel injection uses OEM fuel injectors that inject fuel directly into the combustion chamber. If a vehicle uses direct fuel injection, the fuel injectors are more expensive as they are exposed to more pressure and heat. The materials that make up a fuel injector for direct fuel injection must be of higher quality than an injector used for throttle-body injection or sequential fuel injection. Diesel Fuel Injectors: All diesel engines use some form of fuel injection, unless it is an engine on a tractor. A diesel engine used to use indirect injection, where the fuel was injected into a sub-chamber and mixed with air before it was released into the chamber. 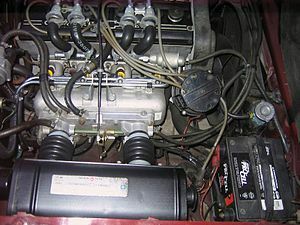 Modern diesel engines use direct injection. The fuel injectors inject fuel directly into the combustion chamber. Direct injection is more thermally efficient than indirect fuel injection. Fuel Injector Cleaning: You may be able to clean your vehicle’s fuel injectors, but that only works for a short while. In most cases, the life of an OEM fuel injector is from 80,000 to 100,000 miles. Once the needle seats, springs and plungers become worn out, the fuel injector must be replaced. It is advisable to replace all fuel injectors at the same time. Some injectors are easy to get to for replacement, but some are under the intake manifold. Getting to the injectors is the hard part. Replacing the actual fuel injector is the easy part.